Town Hall Hotel | rubybeanx. A foodie’s quest to eat her way around the world. Who on Earth is Ruby Bean? The one thing that Sydney does right is schooner glasses. I am a big fan of schooner glasses. A pint glass is too big, my beer gets warm by the time I have about 1/8 of it left. A pot is way too small and I keep having to get up to go to the bar. Midis are even more useless. Jugs are great and temporarily fixes the situation of the warm pint beer, until the bar doesn’t serve beer in jugs. Guh. I believe that Australia should standardise its beer glass size so that every bar sells schooners and jugs. Viva revolution! Anyways, in the meantime. 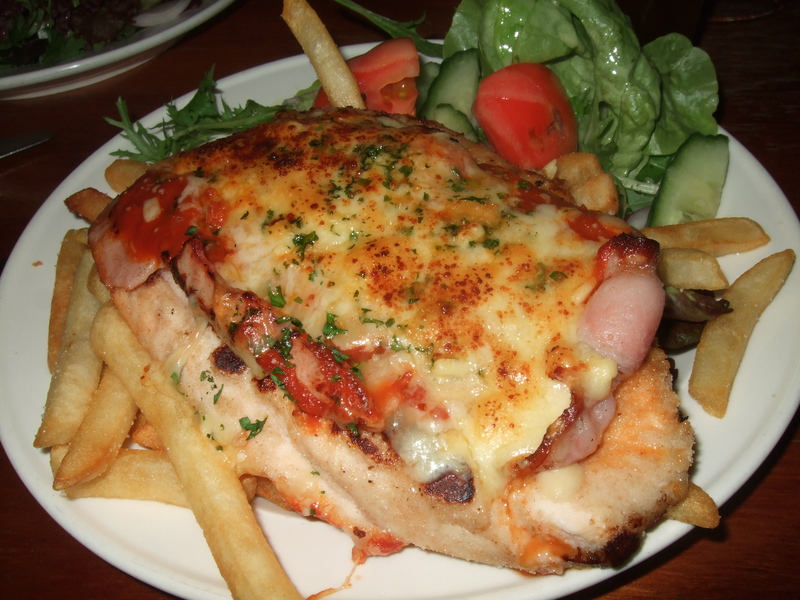 What Melbourne pubs do well is the chicken parmagiana. In fact, they’re kinda rare in Sydney. And when it’s on the menu, it’s $20+. Melbourne has got the parma down. So much so there was a website dedicated to tasting Melbourne’s chicken parmas on the search to crown the most delicious. It became a bible for Melbourne foodies until it shut down a few years ago sad face. But the search continues in the hearts and tummies of many Melbournites to not only eat, but to create the best parma that can be slapped onto a plate inbetween chips and salad. My winner so far is the Town Hall Hotel on Erroll Street, North Melbourne. While looking a bit odd amongst the backdrop of North Melbourne elitism, it caters for the growing number of hipsters and art crowd who are venturing out of Fitzroy and onto slightly westerly pastures. It’s a long bar with a dirty punk rock front bar, a warm and cosy dining room, and a luxurious beer garden with heated booths. The chicken is a thick juicy bit of breast meat that hasn’t been flattened to a pulp. Every single time I’ve eaten it it has never been dry. It has a layer of ham (which is strongly debatable amongst the parma loving community) and a generous (but not too much) layer of golden cheese, slightly charred in all the right places. It sits on top of a bed of hand cut thick chips, and a mound of salad with a nice tangy dressing. I think it’s chicken heaven for the price of $17. And then you can stay for a beer and cool tunes while you discuss that latest post modern art collection by so and so or the latest record by that band that nobody’s heard of yet to the coolest of cool North Melbournites. Don’t: rock up in a large group without a booking because certain waiters are prone to hissy fits because apparently it’s not okay to turn up to a pub with 10 paying customers pft. Tags: beer, chicken, chicken parma, North Melbourne, pub, pub grub. Bookmark the permalink.